If you are searching for a project to keep you busy this weekend, why not create a fully functional super sharp kitchen knife using just a roll of aluminium foil. 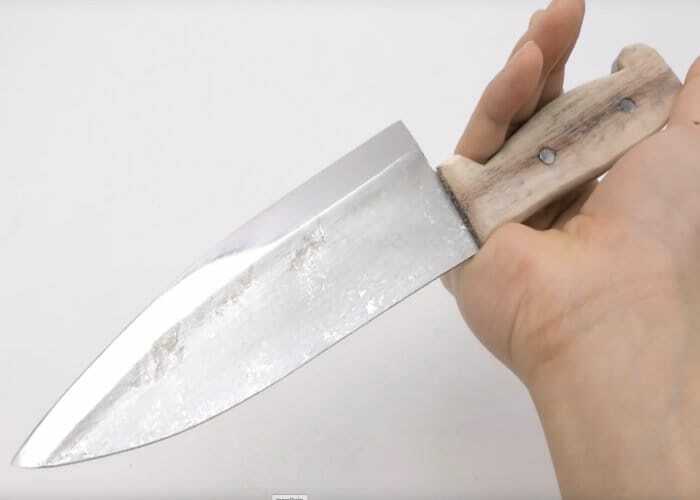 YouTuber “kiwami japan” has done just that and can be seen taking a supermarket bought roll of aluminium foil and transforming it into a fully sharpened kitchen knife complete with wooden handle. Watch the craftsmen at work in the video below. Once the aluminium foil has been hammered into a solid block, this is then split in two and cut to shape using a hacksaw and sharpened using a variety of diamond sharpening stones. That are accompanied by Shiba-Inu- and cow-shaped precision-spout water dispensers which are also featured in the video. The diamond sharpening stones allow the aluminium block to be polished to a precise point and given a mirror finish on the blade, with the body of the blade remaining unpolished to provide a beautiful contrast between matt and mirror finishes. This project is definitely one I will have to add to my list to try and complete, although my knife making skills have yet to be mastered. Check out the video below to see the full process from aluminium foil roll to utility knife.